SENECA – Horse trailers loaded with tough and highly trained endurance horses stirred up the dust near the 96 Ranch in Bear Valley last weekend, as riders gathered for the Seneca Stampede. Northwest endurance rider Diane Dann has created the awards, sponsored by Belesemo Arabians, for the winners of the 50 and 100-mile AERC National Championships, and for the Junior completions in each distance. Each will receive a handmade mini-quilt of a horse. "Quilting is something I had always wanted to do but didn't have the time," Diane said, "so I did lots of crafts, needlepoint, knitting and crochet for many years. Then in 2011 I got the bug, big time, and finally had some time and jumped in with both feet. Since then I have made 8 quilts ranging from king size to lap top, 4 table cloths of varying sizes, 2 wall hangings, 7 rag quilts, 3 table runners and a 3 different sets of placemats totaling 16 and have started to applique. "I had been talking to Steph about making completion awards for any of her rides, as I just love to have projects to make, and she was the one who mentioned the National Championship." Belesemo Arabians has a breeding program centers primarily on the tried and true Crabbet/Davenport bloodlines of Antez, Abu Farwa and Alla Amarward with a touch of Ferseyn, which are proven in the endurance, sport horse and competitive trail fields. Richard Mills is the co-founder of Buck Creek Valley Rescue, a 501c3 non-profit rescue, and he’s about to embark on a long distance ride to raise desperately needed funds for the rescue. Richard will be riding one of the rescue horses that came to the rescue named Willie. Willie is a 6 year old pinto walking horse that came to the rescue in 2012 and was severely abused, being hit in the head with 2‘ by 4‘ boards. Willie was abused and suffered terribly but thanks to Buck Creek Valley Rescue‘s patient care and love he is now a healthy gentle horse who is about to help out those who helped him by focusing attention to and raising funds for the rescue. 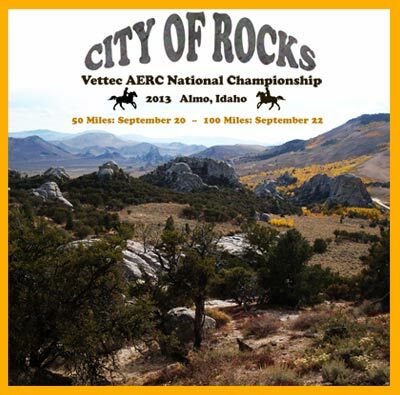 The Vettec AERC National Endurance Championship is coming up soon! The deadline for qualification to enter a 50 or 100 mile Championship division is September 9. All ride entry registrations must be postmarked or received by September 11. Late registrations will be permitted but will incur a $50 late fee. And because Ride Management wants to encourage participation by Juniors - entry fees for Juniors in both divisions will be Half Price! Downloadable and online registration forms will be available soon on the website. Payments may be made with cash or personal check, or if you pay by Visa, Mastercard or PayPal there will be an additional 3% to cover bank fees. 500 lifetime miles (horse) AND 500 lifetime miles (rider), with at least one 100-mile, one-day ride together. The mileage requirements must be met with endurance competitions of 50 miles or more only -- no limited distance miles count towards qualification criteria. All miles MUST be AERC miles. 300 lifetime miles (horse) AND 300 lifetime miles (rider), with at least 100 miles together. The mileage requirements must be met with endurance competitions of 50 miles or more only -- no limited distance miles count towards qualification criteria. All miles MUST be AERC miles. If the horse and rider team has completed 1,000 AERC endurance miles together (rides 50 miles or more only) they are qualified to enter either distance. 3) you can volunteer during one of the rides (50 or 100) that you are not participating in. The Auburn resident, a three-time Tevis Cup winner who started competing in the equestrian endurance event in 1969 at the age of 14, has the opportunity to do something no man has ever done before. If Hall can finish the 100-mile ride that starts Saturday at Robie Park near Squaw Valley and ends at the Auburn Overlook in fewer than 24 hours, he’ll earn a 3,000-mile buckle for finishing Tevis Cup on 30 different occasions — each in less than a day. Hall, however, wouldn’t be the first person to receive the rare buckle. Barbara White of Scotts Valley acquired one — the only one to ever be awarded — in 2010. White, who has known Hall for 45 years, recently expressed that she’d like to be the one to present Hall the hardware when the time comes. Hall, who won his first Tevis Cup in 1974 and last in 1990, will be aboard PR Comet for the 58th running of the endurance ride. The 17-year-old Arabian/Standardbred is a gelding owned by Fred Emigh of Georgetown in El Dorado County. Hall, who also serves on the board of governors for the Western States Trail Foundation, is a three-time Haggin Cup winner. The Tevis Cup is awarded to the first-place finisher while the Haggin Cup goes to the rider in the top 10 whose horse is judged most fit to continue riding at the conclusion. Riding CR Rohbellion, Hall finished in 66th place in the 2012 rendition of the ride in 22 hours, 56 minutes. This year marks the 38th time Hall’s attempted the ride. He was pulled during his first attempt, but a year later at the age of 15 he picked up his first buckle. A local woman who loved horseback riding died Saturday after a riding accident outside Bend. Beth Bliss, a longtime nurse with Asante, and a board member with local horse organizations, was 61. Nine years ago, Bliss was featured in the Daily Courier, after fulfilling a lifelong dream of completing a 100-mile horseback endurance ride called the Tevis Cup, through the Sierra Nevada mountains near Lake Tahoe. Saturday's accident occurred six miles into a 50-mile ride northeast of Prineville. "One of the most important things for us is that Mom went out doing something she loved dearly," her daughter, Sarah, said Wednesday. Bliss died at St. Charles Medical Center in Bend, where she was flown by helicopter after the accident. Her horse apparently stepped in a hole in an old logging road and threw her about 20 feet, according to an account provided by the family. She wore a helmet and was found unconscious by fellow riders. The helmet was dusted, but not otherwise damaged. "She was full of joy and life," Sarah said. "I think she loved it (horses and horseback riding) almost more than anything." Her first horse was a wild mustang she broke herself, after obtaining it from the Bureau of Land Management, back when the family lived in Nebraska. In 2001, the Bliss family moved to Grants Pass, where Beth worked as an emergency room nurse at what is now Three Rivers Medical Center. She left the job after 10 years, until returning in January to an on-call position there. Last month, the family had a reunion on the Oregon Coast, near Lincoln City. "We were lucky to have that time with her so close to her passing," Sarah said. "Mom being Mom did all sorts of things with us: clamming, just enjoying life and having fun with family." Bliss is survived by her husband, Barry, of Grants Pass, and two daughters: Sarah, of Brighton, Colo., and Autumn, of Grants Pass, and Autumn's daughter, Madelynn. A memorial event is set for 4 p.m. Saturday at 10100 North Applegate Road. Visitors should bring a dish to share, beverages, a chair and stories to tell about Bliss. Coincidentally, the annual Tevis Cup is held Saturday. Donations may be made in her name to Grayback Brushriders, P.O. Box 102, Williams, OR, 97544. Bliss was secretary of the organization. Donations also may be made to Rogue Riders, c/o Gerry Luternauer 13237 East Evans Creek Road, Rogue River, OR, 97537. Bliss was vice-president of that group. Hull & Hull Funeral Directors is in charge of arrangements. At only 10 years old, Christina Kimery rode in her first endurance horse race. It was a 25-mile race. Five years later, Kimery is the headed to represent her country in France as the No. 1 racer in the country. "Being as old as I am, it's pretty shocking to me that I can make it to the top," Kimery said. Kimery is the No. 1-nominated entry for endurance horse racing for junior and young riders in the U.S. Think of endurance racing as cross country for horses. The horses are checked by a veterinarian every 15 to 20 miles, and it's a long trek -- so you have to make sure the horse and rider get along. "You always have to figure them out," Kimery explained. "How they are, their personality. To see how they like you, because if they don't they will let you know." Not only does endurance racing take patience for the rider but for the horse as well. It takes two to three years to get the horse ready for races about 75 to 100 miles long. And throughout the race there are some pretty scary obstacles. "My horse snorted and about 50 deer flew around me and then took off. My horse about dropped down to the ground fainting." But despite the obstacles, Kimery has been up to the task, winning multiple national events. And although the trip is costly, it all pays off to hopefully become champion. "It's going to be a chore getting the horse over there. But once its race day it pays off. The feeling of winning and racing 75-100 miles is rewarding." A wide-open field of 165 is set to take on the Western States Trail Ride this Saturday. Starting at Robie Park near Squaw Valley at 5:15 a.m., riders and their horses will attempt to make it to the Auburn Overlook within 24 hours when the 58th annual Tevis Cup gets underway. The prestigious equestrian endurance event will be contested without last year’s winners, Garrett and Lisa Ford, who didn’t sign up because they’re busy working at home in Colorado. Nonetheless, there are still plenty of talented riders and four-hoofed animals entered. “There’s about 20 horses that you could expect to finish in the top 10 because of their record,” said Ride Director Chuck Stalley. “I would pick 10 from that group that the winner would come from. Last year, there were 204 starters but only 98 finishers (48.04 percent) as 106 horses were pulled. Stalley expects the winner to arrive in the Endurance Capital of the World around 10 p.m., but added that weather could be a factor. A cool day could lead to a 9:30 p.m. finish, where a scorcher could slow the horses and their riders down. After reaching the Auburn Overlook, finishers will trot into McCann Stadium at the Gold Country Fairgrounds for spectators. Like the Western States 100-Mile Endurance Run, Tevis Cup has several subplots. Barbara White may soon have company in the 3,000-mile buckle club. White, who has a record 32 finishes, is the only rider in Tevis Cup history to earn a 3,000-mile buckle. Asked why she keeps coming back nearly year after year, White said, “I like it because it’s a historical trail. Stalley said White’s finish rate is unprecedented in the sport. But Auburn’s Hal Hall, who has recorded 29 finishes, could be joining White in the 3,000 club this year if he completes the trail in fewer than 24 hours. Others going for milestone buckles in 2013 include Rocklin’s Pat Chappell (2,000 miles), Grass Valley’s Melissa Ribley (1,000), Canada’s Danny Grant (1,000) and Penryn’s Shellie Hatfield (1,000). Chappell’s quest didn’t go so well last year. Ribley, a local veterinarian, is a former Haggin Cup winner, an award given to a rider whose horse earns a top-10 finish and is judged to be in the best condition after the 100-mile trek. Riders from six foreign countries will be hitting the trail Saturday. Stalley said this is about on par with previous years. Included among the entrants are France’s Stephane Chazel and Thomas Fouquerolle; the United Kingdom’s Sally Toye and Nicole Gilbert; Canada’s Grant, Tina Thompson, Leanna Marchant and Gail Jewell; Japan’s Hiromi Kitaike; Australia’s Rose Ross and Ecuador’s Nathalie Weemaels. There are 12 juniors entered in the trail ride. “They’re under 18,” Stalley said. “Some of them are pretty good because they’ve done a lot of rides. They’re light and young and healthy. The youngest junior is 12-year-old Jack Evers of Laramie, Wyo. In addition to Hall, there are six other riders who hail from Auburn in the field. Shannon Constanti, Greg Kimler, Kathie Perry, Erin Riely-Kelley, Mark Schuerman and Dale Scoville will all be riding toward home when they saddle up aboard their steeds. Angie Mikkelson and MD Maverick won the legendary Big Horn 100 on July 13 2013 near Shell, Wyoming. The ride seems to be "getting tougher due to erosion," said finisher Cindy Collins. "The ground is so hard coming off the mountain now and rockier than ever." 16 of 24 riders completed the 100, including a number of Big Horn first timers. 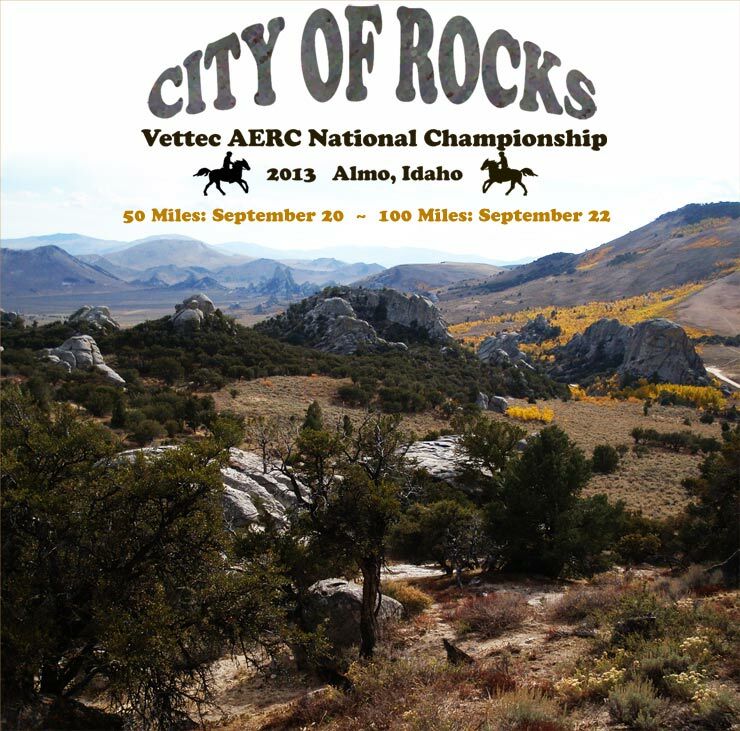 AERC does more than just sanction endurance rides. We also collect and distribute Trail Grant funds for improvement of local trails by hard-working, enthusiastic trails workers. Makes me pretty durned proud! Someone in our region is prepping for a grant application right now and there are resources to help you do that. Does your local trail riding club have an upcoming project? Is your endurance ride camp in need of a little cash in addition to some sweat equity? Sue Walz of Greenwood, California, passed away Thursday July 12 after losing a battle with ALS. She was diagnosed with the disease in 2012 and had been looking forward to a stem cell treatment that her friends and family had raised money for. She will be remembered for her kindness and generosity, her endurance mentoring, and her good horses. Happy Trails Sue! Barbara White calls it an annual pilgrimage. Every year the 65-year-old Scotts Valley resident makes a trek up to Auburn for Tevis Cup, the horse ride along the Western States Trail that begins in the Lake Tahoe area and ends in the Endurance Capital of the World. No one has more Tevis Cup finishes than White, who is the first — and only — person to have ever earned a 3,000-mile buckle for completing the ride in fewer than 24 hours on 30 different occasions. A local trail rider is hitting her stride this summer. Diane Prinsen excelled at her first two competitions and doesn’t plan on slowing down any time soon. She placed first in a competitive trail ride in Lumby, and fifth in a 50-mile endurance ride in Summerland. Prinsen has been taking part in competitive trail rides for five years and broke into endurance riding three years ago. She says she enjoys the challenge and the longer ride, adding that it’s nice to see what your horse can accomplish. “He seems to do quite well at it,” Prinsen said. Arabian horses tend to have good heart rate recovery for trail rides based on their muscle mass. Prinsen said her horse is more muscular so it takes longer for his heart rate to slow down, but they still do well. Prinsen trains on several trails around the Shuswap including South Canoe, Larch Hills and Skimikin. She also owns Brookside Stables where she has an outdoor arena and an indoor arena for training in the winter. Hammer & Saw films with Windcrossing Productions, is proud to announce a feature length Documentary "100 : Head/Heart/Feet" as we follow Zak Wieluns as he trains for & runs this year's 25th anniversary of the Vermont 100. They are also interested in reaching out to and interviewing members of the horse riding community. If you're interested in possibly participating, contact Donna Berghorn at dberghor@colby-sawyer.edu. PORTSMOUTH, N.H. AND BURLINGTON, VER. — Hammer & Saw Films has released the trailer for its first featurelength documentary, 100: Head Heart and Feet, which will follow Maine ultrarunner Zak Wieluns as he trains for and competes in the 25th anniversary of the Vermont 100, one of the original 100-mile runs in the United States. The trailer will give viewers a sneak peek into the unique culture of the ultrarunner on the 100: Head Heart and Feet facebook site, which features Wieluns’ weekly ultrarunning journal accompanied by photo essays and short video clips updating the filming. The award winning producers of Motel and Exit 7A, Mike Mooney and Will Peters this winter began following Wieluns’ intensive training regiment and its impact on his relationships while exploring the reasons he is singularly dedicated to completing the “100.” In the film, to be released later this year, other ultrarunners will explain what motivates them to take part in this extreme sport and discuss the camaraderie among this special group of people. Handlers, sherpas and training partners will examine the friendships that motivate their grueling preparation for the race. Physiologists, nutritionists and sport psychology experts will address the extreme health risks associated with ultra running. This film will celebrate the 25th anniversary of the legendary Vermont 100. The cameras will record all aspects of the grueling race, from the horses that accompany the runners to the stations where runners refuel to the medical check points and the hospital tents. From the base camp to the celebration barbecue, the race’s founders will discuss its history, and fans will relate why this extreme event is so fascinating. In its partnership with Windcrossing Productions, Colby-Sawyer College’s video unit, Hammer & Saw films will feature the camera work of several alumni and involve current students in the project to further their educational experiences. For more information, please visit 100 Head Heart and Feet facebook site https://www.facebook.com/#!/100.Head.Heart.Feet , hammerandsawfilms.com or colby-sawyer.edu/windcrossing. Windcrossing Productions, founded in 1990 by the late Professor Donald Coonley, was reborn in 2011 and dedicated to the creation of interdisciplinary video projects that invite alumni to collaborate with current students and community members. Hammer & Saw films worked with the Windcrossing crew to produce The Checkup and It’s Not Not Safe, which were screened at six film festivals. The journey pushes onward: Four men, 13 Mustangs and more than 3,000 miles. We’ve spent more than two months on the trail and traveled more than 1,000 miles thus far on our trip. We’ve been lucky to find smaller traps or corrals for some nights, but the majority have been spent outdoors where the nearest fence might be 15 miles or more away. Retaining our horses at night is always a problem and we’ve tried many methods. We’ve learned that it is best to be overly safe so that you wake up to the sound of jingling horses, not the sound of scratching heads wondering how far you have to track your stock. The Western States Trail Ride, or 'Tevis Cup' will be held on July 20 of 2013. As of June 14, I am writing to remind riders of required reading of important procedures and rules that may be overlooked at great peril to the rider's successful experience on the Tevis. We want you to know why we have these rules and why it is important that all Tevis riders follow them. All riders are responsible for the conduct of their crews. With that in mind, if we review these procedures and rules at the Friday night rider meeting, many of these key points would not get communicated to the crews until they arrive at Robinson Flat. It is vital that crews know the rules, as well as the riders themselves, enough ahead of time that they can adequately plan and support their rider through this challenging ride. Tevis has a rule that states, "Do not start your automotive engines until 5:15AM on Saturday morning, July 20. At first look, one would think that is clear not to depart from Robie Park until the horses have had a chance to exit the area and proceed onto the Tevis trail. But this rule also includes automotive traffic coming into Robie Park on Saturday morning. That is traffic which may include riders staying in town on Friday night and driving back in to saddle and mount up for the ride. We are stopping traffic coming into Robie from 10:30 pm until 5:30 am. As I interpret this, riders cannot come back into Robie unless they walk in on the ride morning. That means they should consider staying at Robie on Friday night. The traffic will be stopped at the intersection of Road 6 and the confluence of the Western States Trail. It will also be stopped a mile north of Robie Park on Road 6. Tevis ride management would like the riders to stay in camp on Friday night to eliminate any conflicts with horses and riders and vehicle traffic. There is NO crewing of horses from the water trough at the timed finish. Crews can attend to their riders/horses after the team passes under the banner finish in McCann Stadium. Horses have forty minutes to meet criteria from the time they cross the timed finish to vet at the post ride check in McCann Stadium. Please do not crew your horse/rider until they cross under the banner at the risk of disqualification. It takes ten minutes to walk to the stadium at an average walk. To ease pressure on hauled water supplies, please read the following article, which was published in the Tevis Forum, on the correct way to utilize water at checks where management has had to truck the water in. The Marlborough Trail and Endurance Riding (Equestrian) Club held their annual meeting and prizegiving last month with members walking away with plenty of spoils for their season's hard work. There were two categories of prizes. One was based on points and kilometres gained throughout the club's season and the other decided on by the club committee, or individuals. Then any club members present got to vote for who they thought should be Sportsperson of the Year on the day of the prizegiving. The high points awards were taken from points from a minimum of three, up to a maximum five rides in one grade. 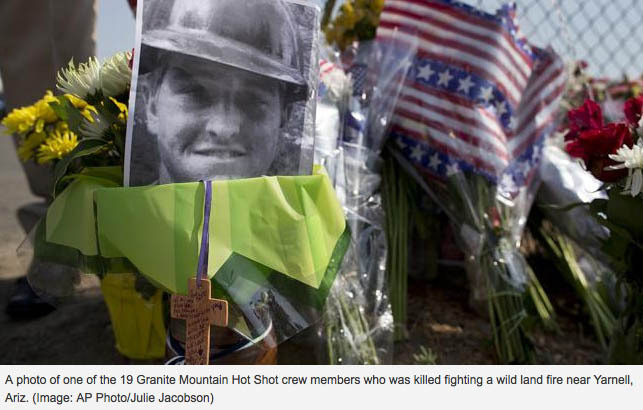 Endurance.Net and the entire trail riding community wishes to express deep condolences to the family, friends and community of the 19 firefighters that died in Arizona. Bruce and Dana Weary, endurance riders from Prescott, lost friends and will be attending a community vigil to honor the young men. These men were among the many men and women who protect our forests and range lands and communities. We all thank them for their service.